Since Brian reviewed this one yesterday at Office Supply Geek, I figured today is as good as any to break out my review of the Bic 4-Color Fashion Colors Multi Pen as well. I came to the same general conclusion that Brian did - this is a good update to an old classic - but I did notice one small difference between his pen and mine: Where is my lanyard hole! That obviously isn't too big of a deal for me, but I do find it odd that there are two different models of this pen. From a writing perspective, it is decent by traditional ballpoint standards. There isn't much ink buildup around the tip, and the lines are generally clean. The pink and purple inks are far superior to the lime green and turquoise though. The turquoise had its share of streaking, while the lime green is too light of a shade. The pink and purple are nice and solid. One issue I had with this pen is that the plungers were very hard to push down, and they didn't loosen up over time either. Instead of just a quick flick of the thumb to push one down, it actually took some force to eject the cartridge. With back to school season in full swing, I expect these will be a big hit with the kids. After all, I am just a big kid myself, and really had fun with this pen. 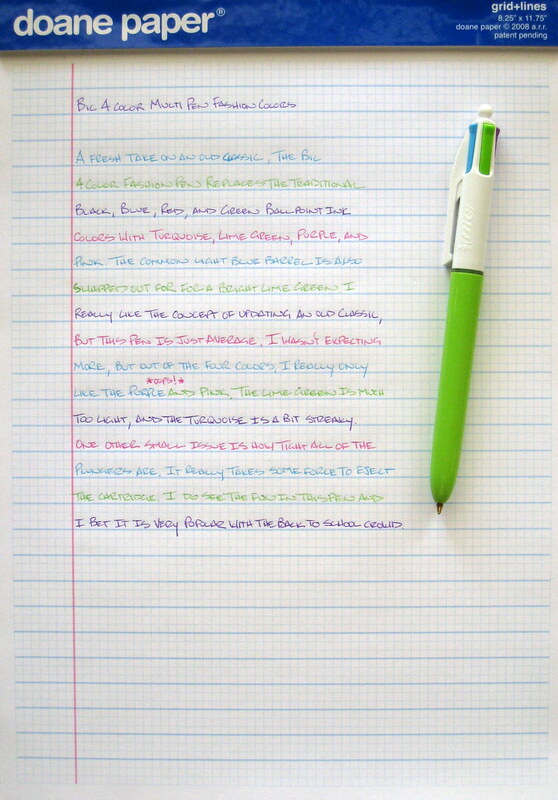 Posted on August 5, 2010 by Brad Dowdy and filed under 4-Color, Bic, Multi Pen, Pen Reviews.